Graduation is a time to build up students' confidence as they prepare to face the next phase of their lives. Focusing on their achievements and celebrating their success can really make a difference in how they approach the rest of their educational experiences. Offering your graduated a graduation tassel that stands out and represents all that they've been able to accomplish is the perfect way to show them just how proud you are of what they've been able to achieve. A red and white graduation tassel makes for a nice pop of color at any graduation ceremony. Representing all the passion and devotion that are necessary in completing such a big step in their education, red and white graduation tassels will certainly help your students recognize just how much their success will change the rest of their lives. The red and white graduation tassel is worn by putting the tassel loop around the button on the top of a traditional graduation cap. The tassel is then draped over the front left side of the cap until students are instructed to turn the tassel to the right side. This "turning" of the tassel represents the big step from student to graduate, and signifies that a student has truly completed this portion of their education and is ready to continue forward. Some schools prefer to start with the tassel on the right and move it to the left, so be sure to ask your school administrators for more specific instructions. Here at Honors Graduation, we offer red and white graduation tassels that are made from the very highest quality rayon. Though the texture of the tassels is soft and delicate, you can count on their durability through the commencement exercises and for years to come. Red and white graduation tassels make a great memento for any graduate, especially if the red and white tassel was chosen because those are your school colors. 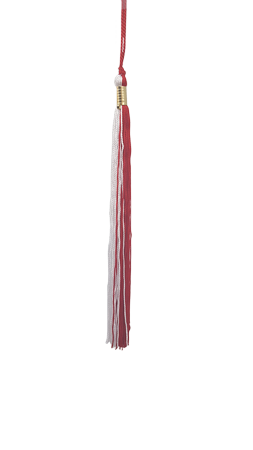 Be sure to order your red and white tassels from Honors Graduation today!